This post has been sponsored by Bounty, but all thoughts and opinions are my own. Being a food blogger, my daughter and I are always in the kitchen cooking! But with fun baking and cooking, also comes a messy kitchen! Just in time to make clean-up fun during our busy summer of cooking as a family, are Bounty with new Despicable Me 3 prints! My toddler loves the Minions, so to clean-up using Bounty’s new limited edition Despicable Me 3 prints featuring her all-time favorite characters, helps get her excited to be my little helper in the kitchen! 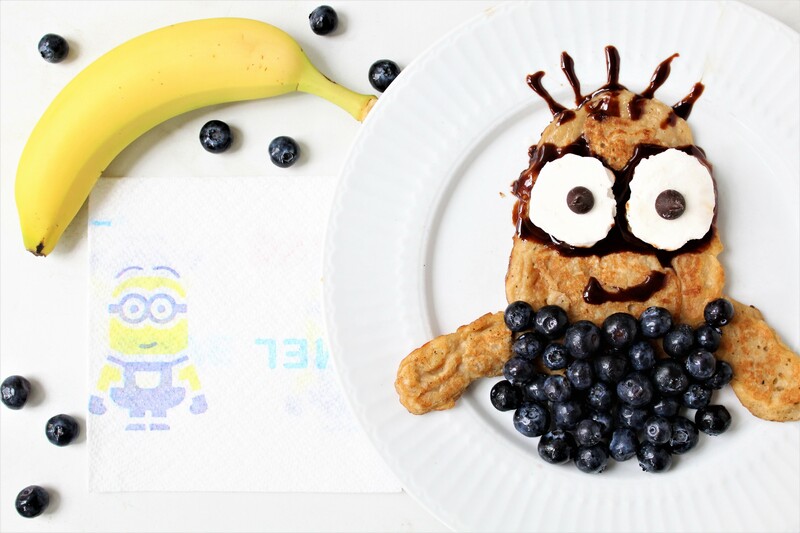 Since we are infusing Minion fun into our kitchen with Bounty’s new Despicable Me 3 prints, we decided to get cooking by making a new breakfast recipe: Minion Banana Pancakes! Mash your banana with a fork, then place in a medium mixing bowl. Add in your milk, apple sauce, and extract. Whisk. Add in your baking powder, salt, and flour, stir with a large spoon. Add oil or butter to a skillet, thouroughly coating the bottom. Turn the heat on medium and cook each pancake till golden brown on each side. When you place your batter on the stove top, with a baking spatula it should be easy to form into a minion shape since the batter is thick. I made an oval shape for the minion’s body, and then two smaller pancakes for his arms. Once cooked, top with blueberries to look like the iconic minion overalls. Scoop two dollops of coconut cream for your minion’s eyes, topped with a chocolate chip. Place 1/4 cup of chocolate chips with a drizzle of oil in the microwave until melted. Place melted chocolate in a condiment squirt bottle to be able to drizzle on your pancake to draw on minion hair and glasses. These pancakes are healthy and delicious, but between using ingredients like applesauce, flour, and mashed banana, Bounty paper towel’s strong hold helped so much in our clean up! Once we were done with our quick clean-up, it was time to serve and enjoy our Minion Banana Pancakes! We enjoyed them with a helping of extra bananas and with Bounty’s Despicable Me 3 print napkins for a very Minion morning! To have fun in the kitchen with your own family this Summer, you can find the new Bounty’s Despicable Me 3 prints in both paper towels and napkins for a limited time. After a morning of cooking, keep the minion celebration going by checking out Despicable Me 3, now in theaters! The film is rated PG and great for the whole family!